As Donald Trump enters the White House, the nation’s leading policy priorities are little changed from the final years of Barack Obama’s presidency. And the partisan divisions over many of the public’s priorities – from dealing with global climate change to strengthening the nation’s military – remain as wide as ever. Roughly three-quarters say that defending the country from terrorism (76%) and strengthening the economy (73%) should be top priorities for Congress and the new president. And two-thirds or more prioritize improving the educational system (69%), improving the job situation (68%) and reducing health care costs (66%). These all have ranked among the public’s top policy priorities in recent years. Still, there are some changes in the public’s to-do list: A majority of Americans (55%) now cite protecting the environment as a top priority, up from 47% a year ago. Global trade, which ranks relatively low on the public’s policy agenda, is viewed as more important than in the past. Currently, 40% say dealing with global trade issues should be a top policy priority, up from 31% last year. On the other hand, the share viewing immigration as a top priority has declined, from 51% to 43%, since January 2016. The national survey, conducted Jan. 4-9, 2017 among 1,502 adults, finds little change over the past year in views of the importance of reducing the budget deficit. But the deficit is viewed as a less important priority today than it was during most of Obama’s second term. Currently, 52% say reducing the budget deficit should be a top priority for the president and Congress. Four years ago, after Obama’s reelection, 72% viewed cutting the deficit as a top priority. About six-in-ten Republicans and Republican-leaning independents (63%) say reducing the deficit should be a top policy priority; four years ago, 81% of Republicans viewed it as a top priority. 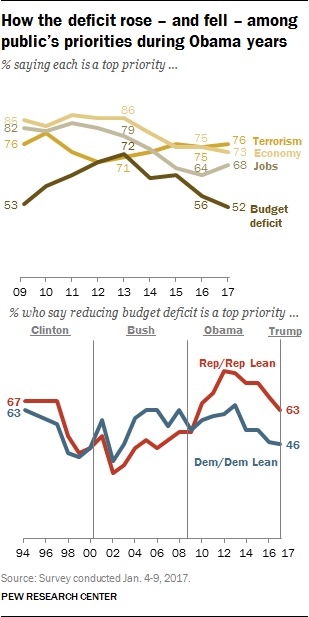 Over this period, the share of Democrats and Democratic leaners citing the deficit as a top priority has declined from 65% to 46%. As in previous policy priority surveys, the widest partisan gap is on the importance of dealing with global climate change. About six-in-ten Democrats (62%) say this should be a top priority for the president and Congress. Just 15% of Republicans say the same – making climate change by far the lowest-ranked of 21 policy priorities among Republicans. 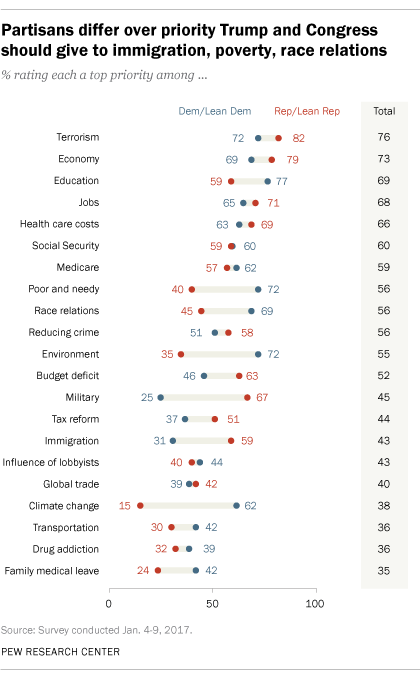 Republicans have ranked global climate change – or global warming in surveys prior to 2015 – at or close to the bottom of the list of policy priorities for more than a decade. At the same time, the share of Democrats who rate climate change as a top priority has steadily increased in recent years – from 46% in 2015 to 62% currently. 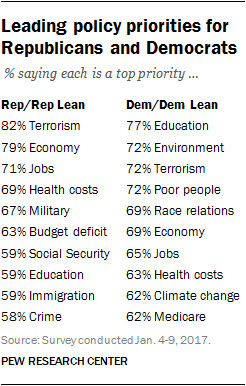 There also is a sizable partisan gap over the importance of environmental protection as a policy priority. While 72% of Democrats say protecting the environment should be a top priority for Congress and the president, just 35% of Republicans say this. While there are wide partisan differences on whether to repeal the Affordable Care Act, majorities of both Republicans (69%) and Democrats (63%) say reducing health care costs should be a top goal of the president and Congress. For Republicans, this represents a sizable change in attitudes. 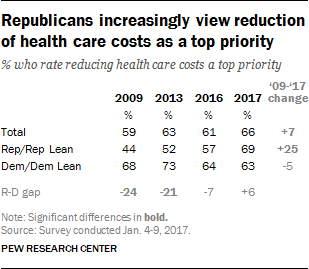 In 2009, just 44% of Republicans cited the reduction of health care costs as a top priority. Over the past year alone, the share of Republicans who say cutting health care costs should be a top priority has increased from 57% to 69%. Democrats’ views have shown less change over this period. As a result, partisan differences over this issue are much narrower today than in 2013 or 2009. Aside from climate change and the environment, some of the largest partisan gaps are on the importance of strengthening the military, dealing with the poor and needy and immigration. Republicans are far more likely than Democrats to say that strengthening the military should be a top policy priority. Two-thirds of Republicans and Republican leaners (67%) say this should be a top goal of the president and Congress, compared with just 25% of Democrats. For Democrats, strengthening the military is the lowest-ranked policy goal. In addition, nearly twice as many Republicans (59%) as Democrats (31%) rate dealing with immigration as a top policy priority. And while 51% of Republicans view reforming the tax system as a top priority, fewer Democrats (37%) say the same. By contrast, more Democrats than Republicans view dealing with the problems of the poor and needy (72% of Democrats, 40% of Republicans), and dealing with race relations (69% of Democrats, 45% of Republicans) as top policy goals. There are several policy goals that Republicans and Democrats have in common, however. With proposals to revamp entitlement programs being considered by the GOP-led Congress, 62% of Democrats and 57% of Republicans rate “taking steps to making the Medicare system financially sound” as a top priority. Nearly identical majorities in both parties (60% of Democrats, 59% of Republicans) also say taking steps to make Social Security financially sound should be a top priority. 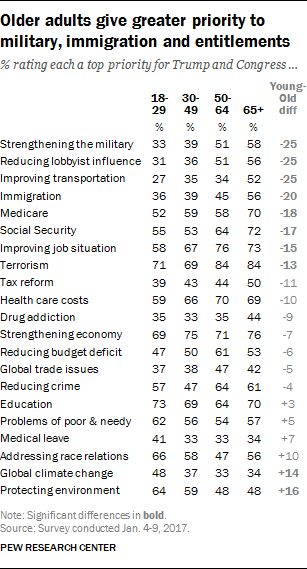 The policy priorities of young people and older Americans differ in key respects. Older adults are more likely to prioritize strengthening the military, reducing the influence of lobbyists, immigration, Medicare and Social Security, among other issues. Conversely, younger people are more likely than their elders to prioritize environmental concerns. While a 58% majority of those 65 and older say strengthening the military is a top priority, just a third of those younger than 30 say the same. Older adults (65 and up) also attach greater importance than younger people (18-29) to reducing the influence of lobbyists and special interests in Washington (56% vs. 31%), improving transportation (52% vs. 27%), addressing immigration (56% vs. 36%), and taking steps to make Medicare (70% vs. 52%) and Social Security (72% vs. 55%) financially secure. For their part, those under 30 years of age are more likely than those 65 and older to say that environmental protection (64% vs. 48%) and global climate change (48% vs. 34%) should be top priorities. Majorities of both those 18-29 and those 65 and older say that addressing race relations should be a top priority for Congress and the president; yet for young people this is a top tier issue, while for older Americans race relations ranks closer to the middle of the policies list. Although the White House changed hands from a Democrat to a Republican, a review of the public’s to-do list shows only modest changes in the public’s priorities from 2016 to 2017. For the last three years, defending the country against terrorism and strengthening the nation’s economy have shared the top of the priority list. While the economy remains one of the top priorities for most Americans, that share has declined over the past several years (from 85% in January 2009 and 86% in January 2013 to 73% today). Similarly, while about two-thirds (68%) now rate improving the job situation as a top priority, public emphasis on the employment situation in the country has declined in recent years – eight years ago (82%) and four years ago (79%), roughly eight-in-ten Americans rated this a top priority.